scw wrote: The recent US ruling on Blurred Line's throws everything into total confusion and chaos (IMO). The ruling was made on "feel". I should clarify that this ruling was made by an American Jury and not the Judiciary. This begs the question why are such decisions made by a Jury? What do they know? Though interestingly (for a given value of 'interesting') the reason that the Stairway case is back in the dock is because of a dodgy jury instruction so there's still some hope. Depends on the Jurisdiction. Could also depend on definitions and interpretations. I'm really not that familiar with that case. Where I am there is a Statute of Limitations on it of 3 years, the last time I checked. It's a bit of a muddy grey area though, as how do you really prove the date someone knows of a possible infringement? ReadySaltedChris wrote: They sound nothing alike. Move on. They have rhythmic keys and drums. So does Back to Black. The similarities end there. True but not bigging myself or anything mate but not only have i got grade 5 piano (just missed out on a merit by 15 marks) but i know more theortical stuff too - like that e minor has two flats and that there's treble, base and tenner clefs. That kinda thing. So yeah, i know things. The two examples I posted sound nothing like back to black and have more in common than just keys and drums. When you listen intently and break apart the two examples I posted, there are really striking similarities, otherwise, I wouldn't be wasting my time or anyone else's. When I say striking similarities I mean even in the structure and different parts enough to pique the curiosity to why they are structured overall so similarly and ultimately have very similar progressions in notes especially when they are played. While I understand this is mostly simple music and not some classical or prog rock stuff, and therefore can be feasibly believed that there is a possibility other people are coming up with a similar thing on their own free from inspiration from mine or anyone else's song, its still important I seek more opinions, yours included, which I appreciate. I also want to iterate that I'm really just doing my due diligence, I own sound recordings where others are represented and if I do not do more investigating then I am not handling my duties and obligations therein, which I prefer to ensure I do. I am also not searching or desperate for something, I'm not hoping on a big break or looking for a big score or some fame thing, I simply walked into a coffee shop one day and heard Chasing Shadows playing, I walked in when there were no vocals on and immediately went, woah that's a song I own, and then after a few seconds went, oh wait its not a song I own but man does that sound similar. Similar enough for me, a very busy man, to want to investigate and source further opinions on the matter. I wouldn't think that with back to black. You don't have to feel you're bragging, all is good, congrats on nice achievements. I can sit back and say some stuff to big myself up as well but I've never been a big theory guy so you definitely have me there, which is cool and I appreciate the opinion. Ultimately what I am getting at, is one musician or professional who may or may not be better, smarter, more talented, experienced than me, isn't going to change my mind or sway me one way or another. That being said I definitely took what you said and put it into the column for definitely a no copyright infringement and put an asterisk beside it for qualified professional. Yours are definitely the opinions I am seeking, however, I have to take it with a grain of salt regardless of anything you or anyone else may say or think. I assure you its strictly business, nothing personal. Ultimately it will be only one of the factors in my decision, which has been rather passive and tepid anyways. I'd definitely take a moment to have a read up on the recent decision on the Stairway case as it goes into a lot of detail around the different assessments of 'access' and 'substantial similarity'. It is a complete minefield. Both of these frameworks grapple with the same thing: to infringe copyright in a work, the defendant must both copy the work and take enough of the work that, well, um, it's too much. But the key is that copying is something that must be proved. In theory, if a magical monkey banged out Harry Potter and the Chamber of Secrets without ever have looked at a copy of Harry Potter and the Chamber of Secrets, that would not be copyright infringement. It would just be unbelievably unlikely. The need to prove copying is actually a fairly important limitation on copyright law. We shouldn't lose sight of it." Basically the plaintiff has to prove that the defendant had access to the work they are accused of copying and that the work they produced is "substantially similar". In the OPs case he will have difficulty proving access unless he can demonstrate the writers of the later work 'probably' did hear his earlier work. OTOH, while I'd say 'substantial similarity' is self evident, the work is not complex enough that there is a reasonable probability that the similarity is a result of coincidence. t'is a bit like being a musician when you grow up? -	Harmonic rhythm on piano: harmony (chords) change x 4 times over the two bar riff. Change of harmony happens on the off-beat resulting in a ‘syncopated harmonic rhythm’. N.b.This creates an overall syncopated groove. -	Drum rhythm: the bass drum uses a combination of syncopated quaver/semiquaver based rhythm in bar 1 whereas in bar 2 is regular using a crotchet (beat 1) and four tuplet quavers (beats 2 & 3). The snare rhythm follows a similar pattern, sounding more syncopated in bar one and regular in bar 2. -	Texture: this two bar instrumental riff consists of piano, kit (kick, snare and possibly hi hat) and sub bass. The addition of a sub base playing a counterpoint melody part against the other two instruments makes for a more interesting and varied texture (polyphonic like). Another interesting point worth mentioning here is that the sub bass on its own sounds like it’s in the key of C (play it on its own and you will see what I mean!). The notes of the sub bass can be heard more clearly if you pitch shift the track by 1 8va. This creates an ambiguous relationship with the implied key of the riff which is Am. -	Harmonic rhythm on piano: harmony (chords) change x 3 times over the two bar riff. Change of harmony happens on the down beat resulting in a ‘regular harmonic rhythm’ (i.e. non-syncopated). N.b. This creates an overall regular groove. -	Drum rhythm: the bass drum uses a combination of syncopated quaver/semiquaver based rhythm and is exactly the same in bar 1 as in bar 2. The snare rhythm sounds only on beats 2 and 4 and uses a combination of regular downbeat crotchet and dotted quaver on beats 2 and four respectively. -	Texture: this two bar instrumental riff consists of piano and kit only making for a simpler homophonic texture. No bass or sub bass here. 2. the implied key in the main 2 bar riff of Am. 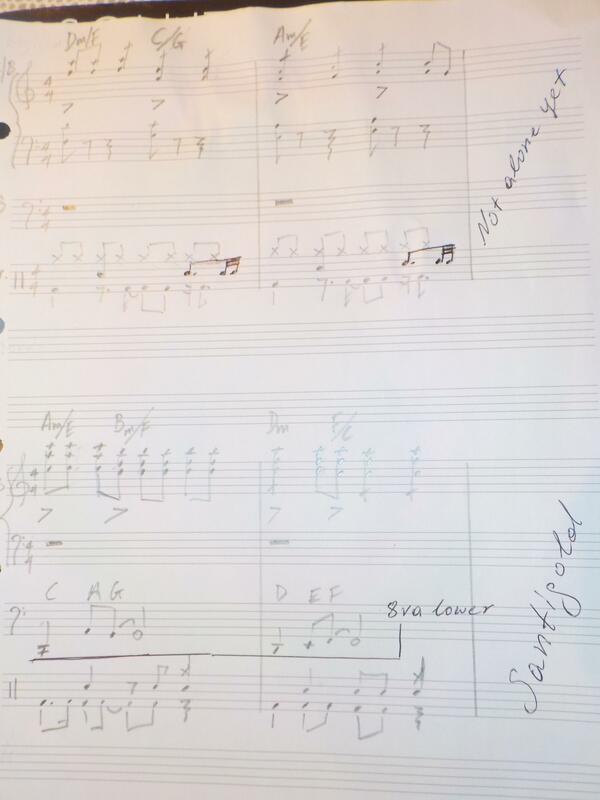 Everything else, as it can be seen from the music score, is very different, particularly the groove I would say (i.e. syncopate in Santigold and regular in yours). Yes, that is exactly what I was looking for! That's incredible work, I very much appreciate your efforts on this for me. While I'm not sure what I could offer you in thanks, feel free to let me know if you think of something. Post of the year 2019 already won I reckon! Sam Spoons wrote: :clap: t'is a bit like being a musician when you grow up? manhattan wrote: Yes, that is exactly what I was looking for! you received on your very interesting post and shed some light from a music theory POV. hope you are a little bit more confident now to argue your case if need be. I am sure you will find a way to repay the favour forward in the future by kindly sharing your knowledge and expertise with other forum members of this special music community.